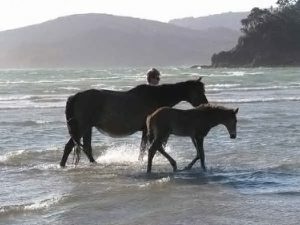 Over the last few years many people have enjoyed the experience offered by Chrissy of GBI Adventure Horse Treks. Childrens groups, beginners, and experienced riders alike have all benefited from her advice, cheerful nature and well behaved mounts. At present she is taking time to reassess her directions, so when we know what she’s planning we’ll let you know. Watch this space! Safe and secure on the back of our brand new ‘Rewaco’ ‘HS5′ trike, is the ultimate way to see Great Barrier Island. The rear seat is designed to carry two passengers in comfort and style while they enjoy the unobstructed view and ‘wind in the face’ freedom that only a trike can offer. We supply the optional helmets and sunglasses, and the experienced driver while you and your fellow thrill seeker buckle in for the ride. Whether you prefer a sedate, relaxed cruise or an exhilirating blast you are in for a unique experience on our 3 seater fun machine. Renowned world wide for their stability and handling supremacy rewaco trikes really are the utilmate ride. Joy rides Enjoy a quick blast down to the beach or up to the lookout etc. The ‘Expresso’ Lets head up to the Claris Texas cafe for the all day breakfast. Might as well check out the local Art Gallery while we’re in the area. The Awana Express Pack a picnic lunch and take an exhilirating ride to the Great Barriers own ‘Surfers Paradise’ (without the highrises). Enjoy some time on this stunning beach, book a return time and we’ll get you back home in style! The Trikeathlon Enjoy the trike ride up the Island and we’ll stop off at the beautiful Kaitoke creek where we hire a kayak and paddle down to the beach. then it’s off to the hot springs, an easy flat 40 minute walk through some lovely bush to the natural springs for a good soak! The ‘Oreville’ run Let’s blow out the cobwebs and take a cool ride to the hot springs for a Great Barrier style spa in the bush, then back on board ‘Crazy Horse’ and out to Great Barrier Lodge on the beautiful Whangaparapara harbour for a cold beer or wine while you enjoy the awesome view. then sit back and relax for the cruise home. The above is just a sample of what we offer. we also do tours like , the Windy Canyon Run, the East Coaster and the all day tour to Port Fitzroy. The above prices are based on tours starting in Tryphena and may differ depending on pick-up area. Why not design your own tour?